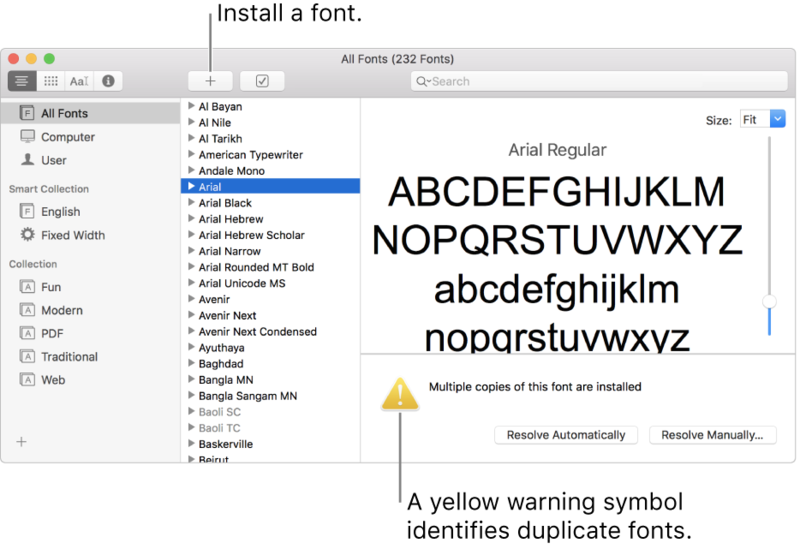 To use fonts in your apps, you need to install the fonts using Font Book. When you’re installing fonts, Font Book lists any problems it finds for you to review. You can also validate fonts later. You can install fonts from a location on your Mac (or a network you’re connected to), or download additional system fonts right in the Font Book window. Fonts that you can download are dimmed in the font list. Install fonts from your Mac or network: Click the Add button in the Font Book toolbar, locate and select the font, then click Open. Tip: To quickly install a font, you can also drag the font file to the Font Book app icon, or double-click the font file in the Finder, then click Install Font in the dialog that appears. Download additional system fonts: Click All Fonts in the sidebar on the left, then select a dimmed font family or one or more styles. Click Download in the preview pane, then click Download in the dialog that appears. If the preview pane isn’t shown, choose View > Show Preview. If you don’t see a Download button, switch to another preview type (the Download button isn’t available in the Information preview). For more about the preview pane, see View and print fonts. All fonts you install or download appear in Font Book, and are available to use in your apps. The fonts you install are available just to you, or to anyone who uses your computer, depending on what you set as the default location for installed fonts. For more information about setting the default location, see Change Font Book preferences. When you install a font, it’s automatically validated or checked for errors. You can also validate fonts after installation if the font isn’t displayed correctly or if a document won’t open because of a corrupt font. In the Font Book app on your Mac, select a font, then choose File > Validate Font. In the Font Validation window, click the disclosure triangle next to a font to review it. A green icon indicates the font passed, a yellow icon indicates a warning, and a red icon indicates it failed. To resolve font warnings or errors, select the checkbox next to a font, then click Install Checked or Remove Checked. Tip: To find warnings or errors in a long list of fonts, click the pop-up menu at the top-left corner of the Font Validation window, then choose Warnings and Errors. If a font has a duplicate, it has a yellow warning symbol next to it in the list of fonts. In the Font Book app on your Mac, choose Edit > Look for Enabled Duplicates. Resolve Automatically: Font Book disables or moves duplicates to the Trash, as set in Font Book preferences. Resolve Manually: Continue to the next step to review and handle duplicates yourself. Examine the duplicates and their copies, then select a copy to keep. The copy that Font Book recommends keeping is labeled “Active copy” and is selected. To review other copies, select one. Resolve the current duplicate or, if there is more than one, all duplicates. If you can’t resolve font problems, go to the Apple Support website.